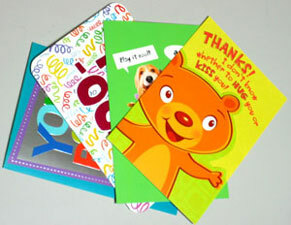 Want to get rid of old or unwanted greeting cards? You could use them to create a greeting card collage. Another alternative is to trash them in the recycle bin. But where's the fun, challenge, and adventure in that? 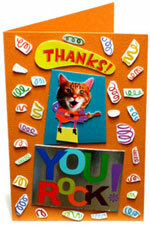 Besides, usually, putting together a collage greeting card art involves using new materials. But if the goal is a non-usual card, then non-new materials is a good place to start. One option is to chop up the old cards into tiny confetti pieces. 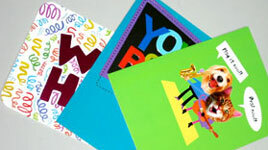 Then use the pieces to create the greeting card art. However, the collage card featured here follows a simpler approach: cutting out and using specific and identifiable shapes, figures, and letters. Obviously, this card is a great way to encourage someone, especially after an on-stage performance. Apart from this, it's also cool for saying thank you. There's more on this in the tips and tricks section below. Score the 8.5” x 11” cardstock and fold into a 5.5” x 8.5” card. 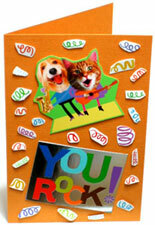 Cut out identifiable images, words, and shapes from the reusable old greeting cards. Arrange the cut outs on the card. The tweezers come in handy here when handling the smaller cutouts. Finally, glue the cut out pieces on the card. 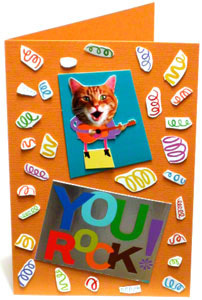 How will you use the cool greeting card collage you create? Feel free to add or take out more pieces as necessary. For example, here’s what the card looks like after adding another character. Also, don't be afraid to use as many cards as needed. For instance, this collage works as a thank you card - just the way it is. But throwing in cutouts from a fourth old greeting card removes any doubt. Mouse-over the picture gallery below to see how.